To connect LCD display 16x2 or 20x4 to Arduino you know you'll need at least 6 wires to connect, it means sacrificing some IO's that could be used for connecting other components such as sensors or motors. another way is to use 74HC595 Shift register for interfacing. In this tutorial we will discuss on PCF85574 I2C LCD Display Interface. 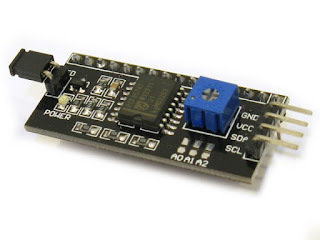 With this module, you can control an LCD display, either 16x2 or 20x4, using only two pins Arduino: the analog input pin 4 (SDA) and the analog input pin 5 (SCL) forming the I2C interface. In the module left side we have 4 pins, and two are for power ( Vcc and GND ), and the other two are the interfaceI2C ( SDA and SCL ) . The plate pot is for display contrast adjustment, and the jumper on the opposite side allows the back light is controlled by the program or remain off for power saving. By default the module is configured with the address 0x27 , but you can change this address using the pins A0, A1 and A2. To control this I2C module, use the library LiquidCrystal_I2C available at this link . Unzip the file and rename the folder LiquidCrystal to LiquidCrystalI2C by copying it to the folder LIBRARIES the IDE of your Arduino.Rename the folder prevents you from having conflicts with LiquidCrystal library that is already built into the IDE.